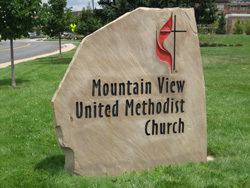 Several years ago Xcel Energy referred Arthur Howe of Mountain View Methodist Church (MVMC) in Boulder, CO to Brayden Automation to analyze their energy use and determine if they could save money on their electric bills by installing a demand control system. Unfortunately, at that time, it did not appear that an Energy Sentry demand controller would be of help in reducing their electric costs since they had only a few controllable electric loads. MVMC was paying around $10,500 per year on their electric bills, so finding an affordable solution to reduce this cost was imperative. Arthur and other church members on the Energy Committee continued searching for an energy solution that would help lower their electric bills. 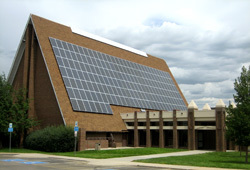 The church decided solar would be the best option and installed a PV solar-electric system through Bella Solar. Fortunately, MVMC had plenty of roof space for a large system consisting of 187 panels. The PV system generates up to 43kW and covers most kWh energy use requirements needed by the church. The result was a savings of around $5000 per year on their electric bills. However, despite most of the kWh energy requirements being met by the PV system, MVMC remained on the “Over 25kW” rate from Xcel Energy. To really make the dynamics of solar work, they concluded that it was necessary to get below and stay below the 25kW threshold to eliminate Xcel’s expensive demand charge. With careful monitoring of use, the church was able to stay below the 25kW demand which allowed them to be moved from Xcel’s “SG” Rate (over 25kW) to the “C” Rate (under 25kW). Xcel’s “SG” Rate has a standard kWh charge as well as a kW charge, that ranges from around $17 per kW in the winter to $20 per kW in the summer. In contrast, the “C” Rate has only a kWh charge, meaning there is no demand charge. Even though the PV system was able to move them to the cost saving “C” Rate, Arthur was worried they would go over the 25kW limit at any time and get pushed back onto the more expensive “SG” Rate. This could easily happen in situations where the church is experiencing high peak demand in short time periods due to special events, or when the PV system is not functioning during nighttime hours or cloudy & overcast days. Bella Solar contacted Bill at Brayden Automation to see if a demand control system would keep them on the “C” rate. Using a different strategy with some very creative control suggested by Arthur, it was determined that a 9388B Energy Sentry demand control system using WireLynx powerline carrier components would be able to keep MVMC below the 25kW demand limit and ensure cost savings were achieved. In July of 2012 the Energy Sentry 9388B was installed and programmed to control 7 electric loads; 1 air conditioning unit, 2 heating units, 2 swamp coolers, a dishwasher, and a range. Because the church did not have enough of the standard large electric loads to control, Brayden Automation had to get a little innovative with the control strategy. Usually, an Energy Sentry does not control loads like a range, swamp cooler, or dishwasher. However, this was a unique situation so Brayden Automation developed special control switches to use specifically with these appliances. By adding the additional non-standard loads to the demand control strategy, the church’s demand limit could be set at 23kW, keeping them well below the 25kW limit. This guarantees that MVMC will remain on the “C” Rate, and they are saving a further $5000 per year on their electricity bill. The solar power plus the demand control is thus saving about $10,000 per year. By utilizing solar generation and demand control, MVMC has reduced their yearly electric bill from $10,633 to $168. MVMC is an ideal example of an organization fully capitalizing on the combination of solar and demand control to maximize their cost savings as well as their returns. Although solar can have a solid impact on your electric bill, many times a demand control system is needed to help minimize or eliminate the impact of demand charges. To learn more about how Solar and Demand Control make a perfect pair, read our June 2012 Newsletter. If you are interested in learning more about Energy Sentry demand management systems and how they can be used with Solar Applications please call us today at (888) 272-9336. Next Article: Do you have High Electric Bills?